Tibetan Buddhism is structured on the notion of ‘transmission’, the passing on of teachings and methods from the teacher to the student – who in his turn hands on the teachings to his own students. This has given rise to a number of ‘lineages’; lines of descent of dharma wisdom from one great master to the next. These masters are often ‘reincarnate lamas’, with alternate ‘lineage-holders’ holding the transmission during the period from the death of the reincarnate to the coming of age of his next incarnation. 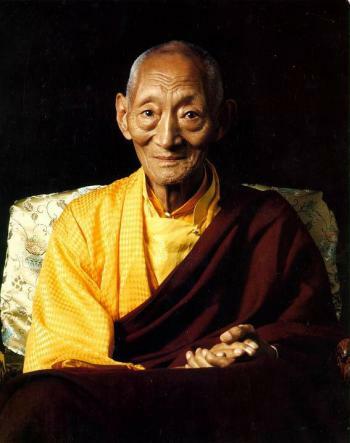 The Karma Kagyu school of Tibetan Buddhism is an example of one such lineage. The Karmapa, who first incarnated in the 12th century and is now in his 17th incarnation, is a treasury of teachings; his lineage-holders – reincarnates themselves – are the Shamar, Tai Situ, Jamgon Kontrul and Gyaltsap Rinpoches. This is sometimes called the Whispering Lineage, not because the master literally whispered the teaching to his pupil, but rather in reference to the continual verbal transmission to a select number of high calibre students. The Karma Kagyu Lineage is the Yogic transmission among the four main schools of Tibetan Buddhism. It encompasses both the old (Nyingma) and the new (Sarma) teachings which reached Tibet. Being heavily practice oriented, the Kagyu is called the “oral” or the “perfection” school. The origin of the Kagyu Lineage dates back to the ninth century at the time of the full flowering of Tantric Buddhism in India. The first teacher in this tradition was Tilopa, the renowned yogi and Mahasiddha (perfected one). 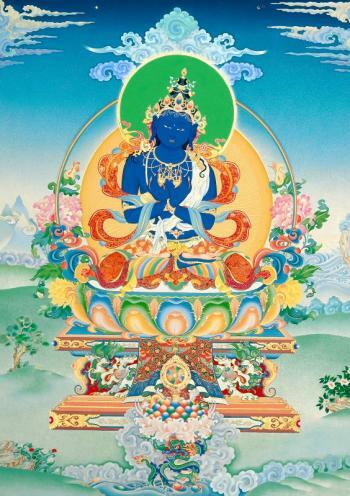 Tilopa received the transmission directly from Dorje Chang (skt. : Vajradhara), the celestial Buddha who symbolizes the Dharmakaya, the ultimate mind. Tilopa in turn gave the whispered teachings to Naropa who had previously been chancellor of Nalanda University in India. Naropa’s twelve years of service to Tilopa are regarded as a great example of devotion to one’s teacher. The first Tibetan to receive the teaching was Marpa, the Translator, so named because of his heroic efforts to reach India on foot, searching for his teacher Naropa, and patiently practicing and translating the Mahamudra teachings into Tibetan. Marpa was a householder and landowner and he gathered around him a number of students; the main one was Milarepa. Because of the bad karma acquired through his early deeds as a sorcerer, Milarepa was submitted to years of arduous purifying labor before Marpa would grant him the teachings. 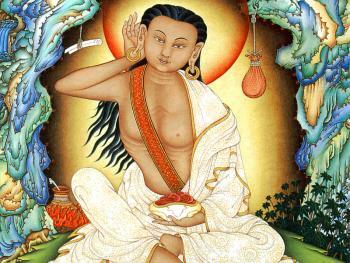 Milarepa spent many years meditating in caves, gained profound illumination and was famed as a poet and saint. He died at the age of 80, at which time the lineage passed onto Gampopa who had previously been a doctor. Gampopa was the first monk of the Kagyu School and he organized the Kagyu monastic system. He also formulated the teaching in practical texts such as the “Jewel Ornament of Liberation” which outlines the gradual path to liberation. Four major and eight minor schools originated from Gampopa’s three main disciples. The major schools have all fused into the Karma Kagyu with the Karmapa as the head. The first Karmapa, Dusum Chenpa, was Gampopa’s most gifted disciple. He manifested great spiritual power and purity early in his life and in his sixteenth year he received a supernatural Black Crown from dakinis and other divinities which bestowed knowledge of the past, present and future. 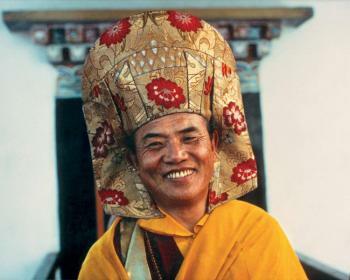 This hat has been passed on to all the subsequent Karmapas who are reincarnations or “tulkus” of Dusum Chenpa. All the Karmapas have worked unceasingly to spread the Buddha’s teaching, and are recognized as emanations of the bodhisattva Chenrezig (skt. : Avalokitesvara). Gautama taught a Middle Way between sensual indulgence and the severe asceticism found in the Sramana (renunciation) movement common in his region. He later taught throughout regions of eastern India such as Magadha and Kosala. Dorje Chang is the Tantric form of Sakyamuni Buddha which is called Vajradhara. Tantras are texts specific to Tantrism and are believed to have been originally taught by the Tantric form of Sakyamuni called Vajradhara. The Karma Kagyu lineage traces itself back over two hundred years before the first Karmapa, to the Indian source of their knowledge – Tilopa. He is often to be seen at the top of the traditional paintings or thangkas of Kagyu refuge trees and looking every inch the ascetic. A Brahmin, from East India, Tilopa was only a boy when he encountered the famous master Nagarjuna, whose supernatural abilities later caused a state oracle to select Tilopa as ruler of a small Indian kingdom. Some years later, disenchanted with worldly power, he became a monk at the Tantric Temple of Somapuri in Bengal. We are told that one day a dakini (a female wisdom-giver) came to him in a vision, and offered him her knowledge as a route to enlightenment. 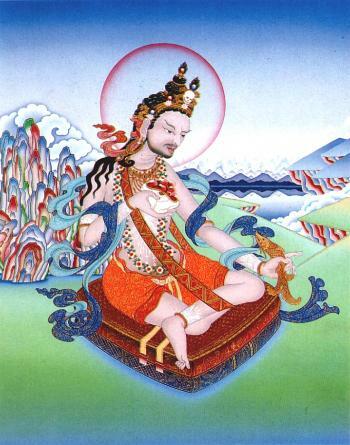 Seizing his opportunity, Tilopa requested her teachings, and received the initiation into the Chakrasamvara Tantra – which, such were his abilities, he was easily able to understand. For twelve years he practiced this teaching at Somapuri, but when the monastery saw him take a female consort for the practice of union yoga, he was forced to quit the community. Tilopa profited from his expulsion by travelling throughout India, searching out many teachers, and learning their methods. He earnt his living during this period by grinding sesame seeds (‘Til’ in Sanskrit) for oil – giving him the name by which we know him today. He was given direct transmission of the Mahamudra and other teachings, by the Buddha Vajradhara (Tib. Dorje Chang), who became his root guru. Although he chose to live in remote and inhospitable regions, his fame as a meditation master brought him excellent students, from whom he selected Naropa as the lineage holder. Born Samantabhadra, a Bengali prince, Naropa (1016-1100) rebelled young against his royal training. Eight years old, he demanded to go to Kashmir, to follow an intellectual education with the best teachers of the age; three years later, he finally embarked upon the study of logic, science, grammar, rhetoric and art. Meanwhile his parents, according to the custom of the time, had arranged for his marriage to Vimaladipi, a Brahmin. The ceremony took place upon his return, but eight years later Naropa insisted on its dissolution, and promptly returned to Kashmir to be ordained and to undertake further study. Several years later, at twenty-eight, his interests drew him to Nalanda University, near Pullahari, famous for its Buddhist philosophers, and of which he became Abbot in due course. But then a dakini appeared to him, telling him that meditation practice was more important than philosophizing, and that he should search out a certain Tilopa for instructions. Abandoning his vows, Naropa set out to the East to find this teacher – often seen paired with Naropa in thangkas. 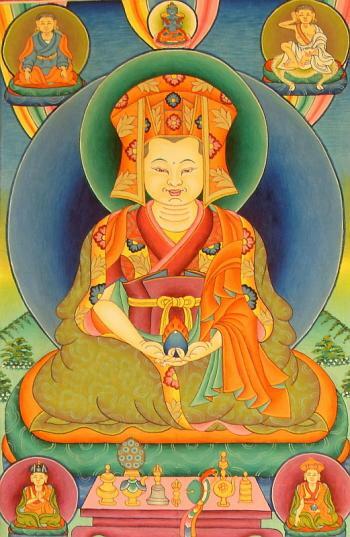 He did eventually meet Tilopa, without recognizing him, and was put to twelve gruelling tests. 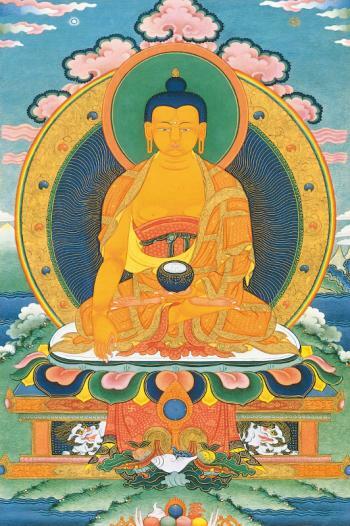 He persevered, however, mastered Tilopa’s teachings, and took disciples of his own. Two of these disciples were encountered on the road by a Tibetan, Marpa (1012-1097), come to Nepal in search of the dharma. Buddhist from his earliest youth, he had learnt Sanskrit from the Sakyapa Lama Drogmi, then exchanged all his belongings for gold, in preparation for his quest. So impressed was he by Naropa’s disciples, he decided to become one himself. For many years he received Naropa’s teachings, as well as studying with a variety of famous Indian masters including Jnanagarbha, Kukuripa and Maitripa. Having practiced and mastered the teachings, Marpa returned to Lhodrag in South Tibet, where he lived with his wife Dagmema and their two sons, and spent several years translating the Buddhist scriptures from Sanskrit into the vernacular Tibetan. Renowned as a translator, he attracted a group of students to whom he passed on the fruits of his Indian research. After two further expeditions to India, from which he carried yet more teachings back over the mountain passes to Tibet, he returned to find a student named Milarepa had been sent to him. From the Gungthang province of Western Tibet, close to Nepal, Milarepa (1052-1135) had had a hard childhood and a dark youth. Only seven when his father died, relatives had taken over his father’s property, and maltreated the bereaved family. His mother, bitter, sent Milarepa to train in black magic, to wreak revenge on those who had blighted her life. She was given her wish -Milarepa proved adept at the practices he was taught, and unleashed a tide of destruction, killing many. But he came to regret his actions, and looked for help in shedding the bad karma he had acquired during his vengeful adolescence. He first attached himself to a Nyingmapa Lama Rongton, who, observing that Milarepa had an affinity for Marpa, sent him to await Marpa’s return from his travels. Milarepa’s reward was to suffer years of testing at his master’s hands. Among other trials, he built a nine-story tower, to Marpa’s specifications. 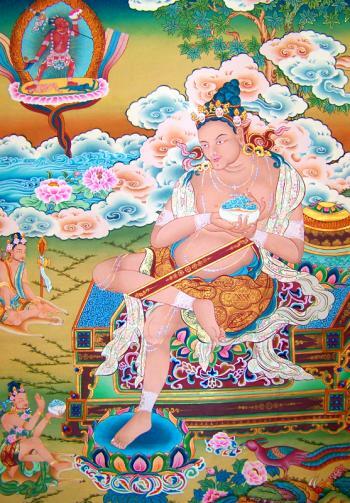 But finally, Marpa gave Milarepa full transmission of all he had learnt from Naropa and other Indian masters. Practicing these teachings for many years, Milarepa attained enlightenment, and gained fame for his songs. Of his own students, Gampopa became his lineage-holder. From Nyal, in East Tibet, Gampopa (1079-1135) was the son of a doctor, and a doctor himself. He married in his early twenties, and fathered two sons. Several years later, an epidemic took both their lives, despite his skill. His wife falling sick of the same disease, and similarly failing to respond to his ministrations, begged him as she died not to marry again, but to become a monk. One might question her motives, but nevertheless, at the age of twenty-six, Gampopa became a novice in the Kadampa tradition. He applied himself, working with many masters, and achieved a high degree of proficiency before – at thirty-two – hearing talk of Milarepa. Feeling a surge of devotion in response to these tales, and understanding that this must be his true teacher, he set out on a gruelling but eventually successful search to find him. Gampopa, a talented writer, of great insight, was entrusted by Milarepa with the complete Kagyu transmission – the only one of Milarepa’s students so honoured – before leaving Milarepa to go into retreat at Dagpo in South-East Tibet. There he founded the monastery of Daglha Gampo, where he drew many disciples. Four of these were to found the four “major” Kagyu branches. Eight “minor” branches would appear later. One of the four, Dusum Khyenpa was both the next Kagyu lineage-holder, and the first Karmapa. Born the son of a practising Buddhist in Ratay in East Tibet, Dusum Khyenpa (1110-1193) received his first dharma teachings from his father, and continued his education with other Buddhist teachers of the region until his twentieth year. Then he moved to Central Tibet where he spent the next twelve years in meditation and in study with famous scholars, among them Kyabpa Chokyi Senge, and Patsab Lotsawa Nyima Trag. 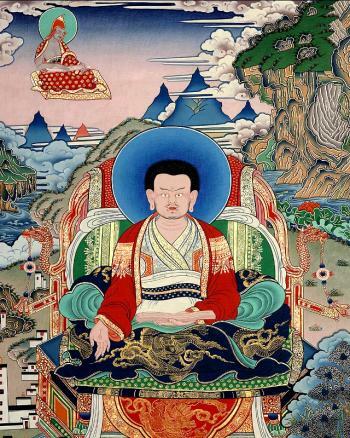 At the age of thirty he was given Kagyu teachings by Gampopa; he was farther connected with the lineage by teachings he received from Rechungpa and from other students of Milarepa. The depth of his practice was such that he developed siddhis (powers) that enabled him to visit the sacred sites of the Diamond Way in India. At one of these, Udhiyana, dakinis shared their wisdom teachings with him. At forty-four, he left Central Tibet to return to the region of his birth, and spent the thirty-nine years until his death in establishing three thriving monasteries, sharing the Kagyu teachings, and training his students. Of these, he chose Drogon Rechen to be the next lineage-holder. The sixteenth Karmapa, Rangjung Rigpe Dorje (1924-1981), was born at Denkhok in Derge province in east Tibet. Jampal Tsultrim, the fifteenth Karmapa’s personal attendant, had been entrusted by his master with a letter setting forth the circumstances of his new incarnation. Jampal Tsultrim now handed this letter to the authorities at Tsurphu monastery, who – having had Beru Khyentse, Situpa and Jamgon Kontrul clarify certain points – sent out the search-party which successfully located the child. He was taken to Palpung Monastery where Situ Pema Wangchok gave him ordination, bodhisattva vows, and many teachings. In addition, Beru Khyentse Lodro Mizat Pampa’i Gocha taught him the Tantra, Bo Kangkar Rinpoche taught him the sutras, and Jamgon Palden Kyentse Oser taught him Mahamudra and the Six Yogas of Naropa. He would come to regard Situ Pema Wangchok and Jamgon Palden Kyentse Oser as his main gurus. His life took on the pattern of his predecessors, travelling and teaching throughout the country. But then political circumstances intervened, with the 1950 take-over of Tibet by the Chinese. The Dalai Lama, with government officials and many high lamas, including the sixteenth Karmapa, attended talks in Beijing, in the hope of negotiating a settlement. The discussions were successful in buying some time for the Tibetan people, but in 1959 the Chinese proceeded to annex Tibet, at which point the Karmapa fled to India. 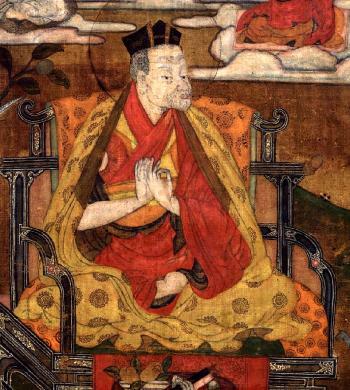 The King of Sikkim, Tashi Namgyal, offered the Karmapa land, upon which he built Rumtek monastery. He also accepted an invitation to come to Bhutan by their King, Jigme Dorje Wangchuk. He travelled to Ladakh, teaching at various monasteries, before going on pilgrimage to holy sites in India and Nepal. His travels continued to broaden in his efforts to spread the dharma; in 1974 he came to the West for the first time, as dharma centers were established world-wide, and he attracted an increasing number of followers. Having escaped from Chinese-controlled Tibet in 1994, His Holiness Karmapa has lived in New Delhi and Kalimpong for many years. He travels extensively throughout India, attending significant events such as the Kagyu Mönlam in Bodh Gaya each year, teaching and granting empowerments to students. He has also visited many countries in Asia and Europe, as well as Russia, starting with giving empowerments to thousands of students in Taiwan and Singapore in 1999 and continuing actively to this day. His formal education was completed in 2003, at which time he received the title of Vajracharya, or Great Tantric Master. Throughout the 2000s, Karmapa Thaye Dorje travelled extensively in Europe and the West, including the USA for the first time in 2003. He has visited the UK three times to date. In 2005 Karmapa Thaye Dorje was the guest of honour at an interfaith reception, hosted by St Ethelburga’s Centre for Peace and Reconciliation, in the presence of the Bishop of London and spiritual leaders from the Hindu, Christian, Jewish, Muslim, Sikh and Jain faiths, where he delivered his keynote speech. 2005 His Holiness visited and blessed our centre Karma Ratna Dargye Ling in Tar. 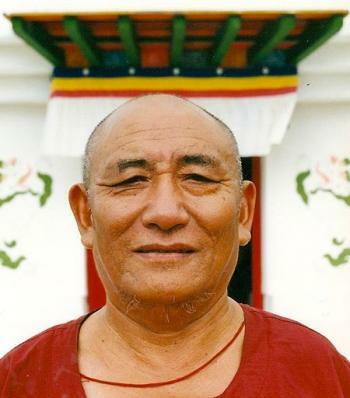 Kalu Rinpoche was one of the most outstanding buddhist teachers who was known and respected by all smaller and bigger Tibetan tantric schools of our time. He was born in the area of Kham in East Tibet. His Holiness the 16th Karmapa once said that Kalu Rinpoche was the reincarnation of Milarepa, the 12th century yogi. Milarepa was definetaly the most famous and well known enlightened Tibetan master. His respect for all religious traditions and love for all living beings reflected in all his activities, in all his words and in all his movements. 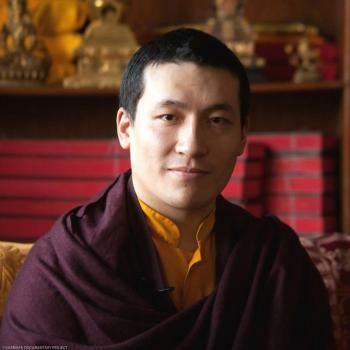 Lama Ngawang entered the spiritual path through the gate of dharma in early childhood. He received a full monastic ordination from his Holiness the Karmapa and spiritual heirs. He renounced all his worldly and samsaric activities, and devoted himself to religious life. He studied, listened to and researched the pure dharma, and practiced it alone in desolate places. Having completed a full 3-year retreat in Sonada, Darjeeling, he was given the honorable Vajra Master title. After that, in 1976, Kalu Rinpoche sent him to the West, to Sweden, to spread the holy dharma for the benefit of all living beings. All desciples and all well-intentioned people should know that the goal can be reached if one follows a lama with the right motivation, and generates an unmoveable faith and devotion, studies the dharma, and meditates. It is important to keep all this in mind, because then you will have the chance to reach buddhahood, the state of purity and perfection, for your benefit, and for the benefit of all. Lama Tsültrim Rinpoche has been recognized as the incarnation of the famous Champa Rinpoche by His Holiness The Panchen Lama. Lama Tsültrim Rinpoche was born in 1968 in Tibet. He completed the traditional 3-year retreat led by Drupon Dechen Rinpoche in the home of Karmapas, in Tsurpu. After the retreat he was delegated to lead the Jangpachen Monastery, then he was the lama in charge of the meditation center in Singapore for two years. Since 2000, he has been the assistant to and the successor of the Venerable Lama Ngawang at our sister sangha in Sweden. 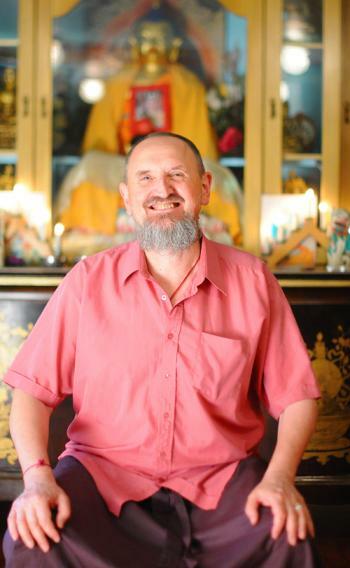 Venerable Lama Chopel has been studying and practicing the Inner Path under the guidance of the most prominent masters of the Tibatan tradition since he graduated from the Royal Swedish Academy of Arts in 1974. He completed the traditional 3-year meditation retreat in Sweden. 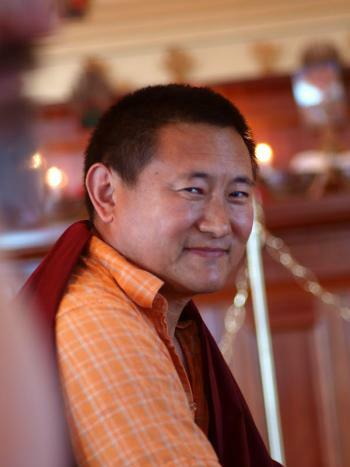 At present, fulfilling Lama Ngawang’s request, he leads three meditation centers in Hungary. He also gives teachings in Sweden, Transylvania, and Slovakia. He authors numerous books, in which he translated or commented the teachings of the Indian and Tibetan masters of the Inner Path, providing an opportunity for all of us to gain true understanding, and to live our lives according to the practices he teaches. With his life and dedicated work he is a true follower of his masters.